Great adition made by Mr. Roger Warin! I recently received a beautiful sample of the characteristic hopper crystals of gold from this locality with request to analyze the composition. According to the study on the geology and metallogeny of gold deposits in Pontes e Lacerda by Geraldes et al. (International Geology Review, 1997. DOI 10.1080/00206819709465282) we expect pure gold for this type of samples (one deposit reported Au-Ag alloy or electrum). 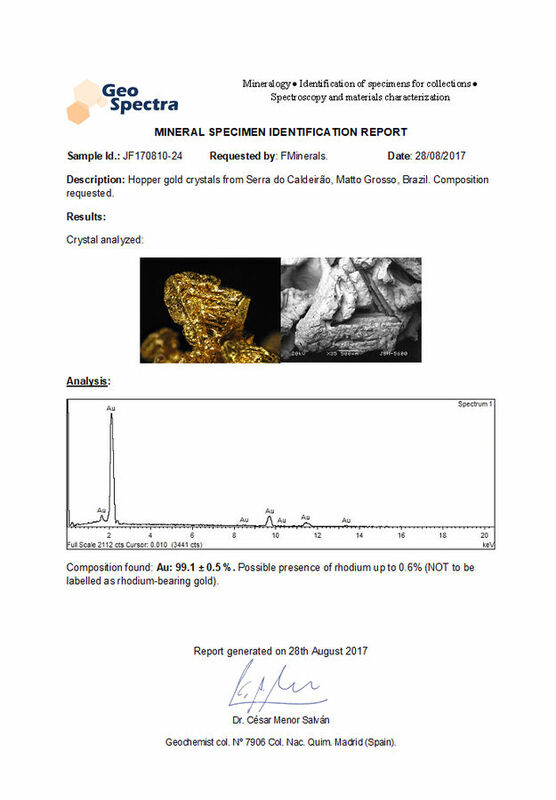 Indeed, the analysis showed very pure gold, with 98.5 to 99.5% Au in the analyzed sample. I performed EDS analyses. The determination of the exact composition would require a technique that could compromise the integrity of the sample, and it is not necessary for the needs of a mineral collection. Obviously, this does not mean that all samples are composed by pure gold. 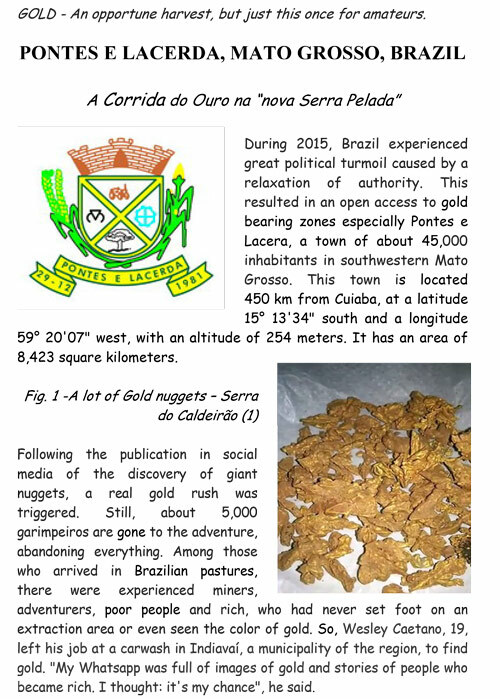 Depending on the deposit (there are about 23 gold deposits in the Pontes e Lacerda region) there are variable amounts of other noble metals, silver and copper. But in this case, this seems to be a very pure sample. 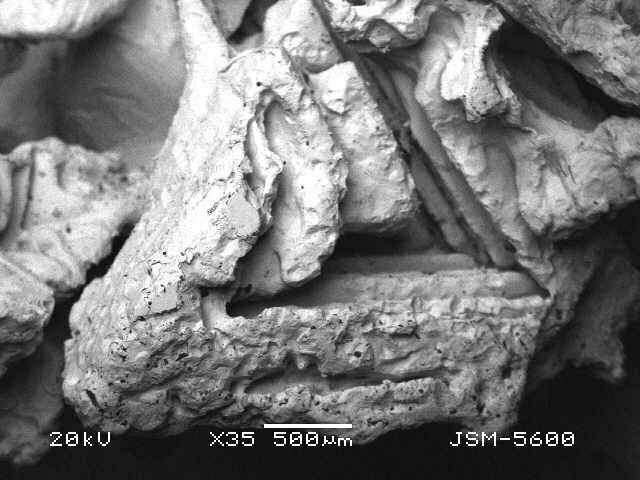 SEM image of a hopper crystal of gold. 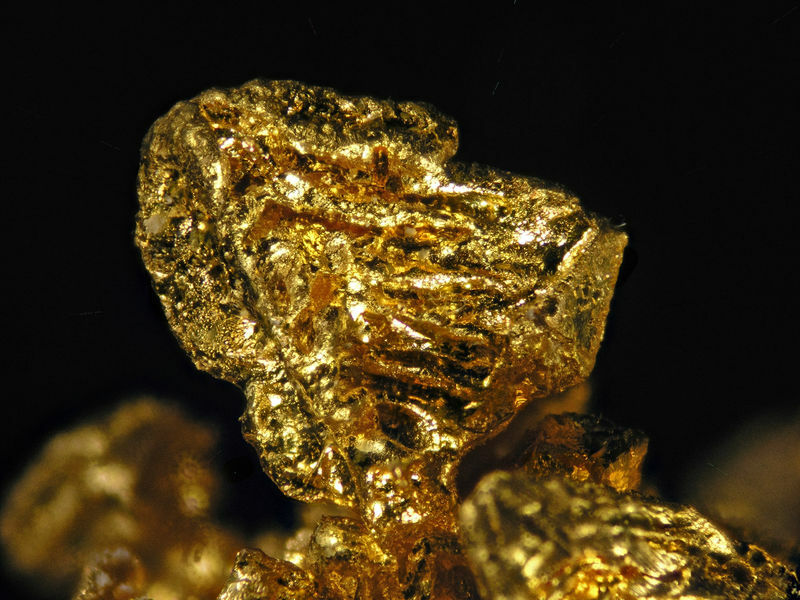 Interesting features on the surface of gold crystals. 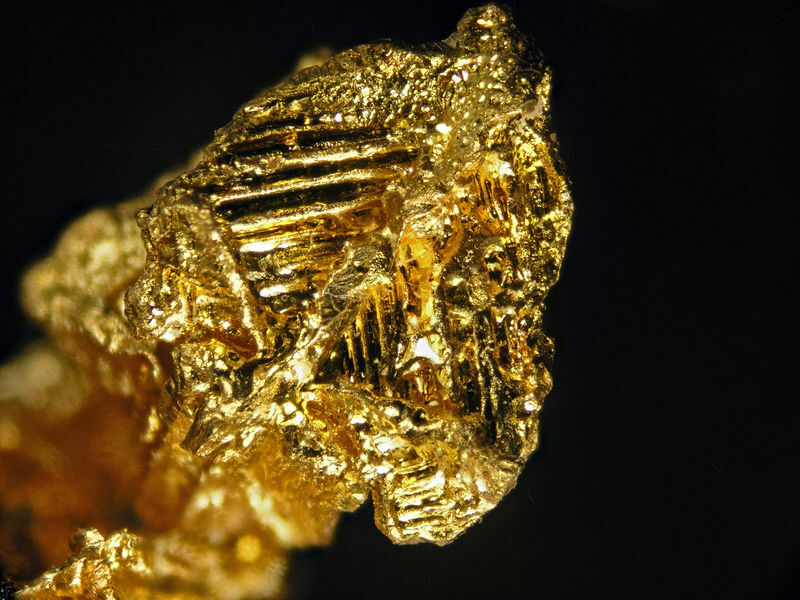 I cannot say of these minute crystals and spherules, composed by pure gold, are syngenetic with the crystals or a posterior deposition (by bacterial activity for example). I am considering doing a research about the geochemical/ morphology characterization of the lateritic gold mineralization of this area. The work of Geraldes is quite useful, but I understand it is focused on the hydrothermal gold, instead of the later supergenic. On the other hand, I found out this data on the Fabre website ( https://www.fabreminerals.com/search_show.php?SECTION=RSBR&CODE=TF7AD3 ), informing about the presence of Rhodium in a sample from the location. I analysed the composition of my samples by FRXP, which displayed 99,7% Au and no appreciable amount of Pd, Pt, Rh, Ag, neither Cu. Only some Fe, and trace elements.About the morphology, the habit seems to me to an open geometry skeletal square pyramid. 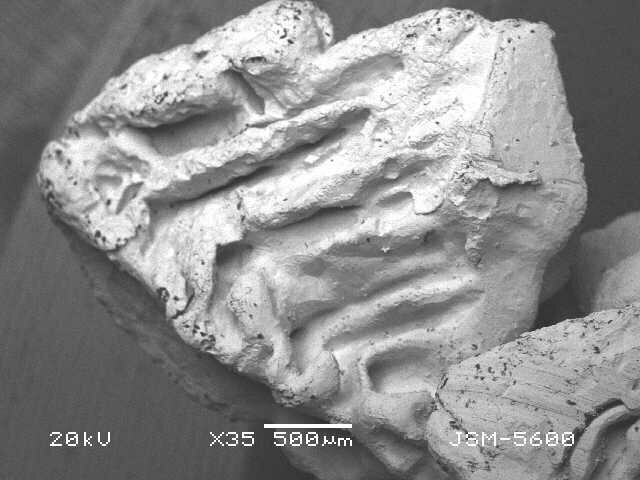 It would be of great assistance, to get some more information about the morphology and minor/trace elements composition of this occurrence. A so very pure gold (99,5-99,7% purity) is not odd, being a natural sample? Some time ago, and from a usually quite well-informed source, I heard a RUMOUR, that specimens destined for the mineral collectors market were then submitted to electrolytic gold plating in order to make them look "shinier". A rumour is a rumour and no proof of evidence, but to some extent this would explain the extreme high fineness and luster. Some time ago and from a usually quite well-informed source, I heard a RUMOUR, that specimens destined for the mineral collectors market were then submitted to galvanic fine gold-plating "enhancement". Alluvial gold is always enriched in gold on the surface, by natural chemical processes (leaching out of silver), so there is no need for artificial gold plating! 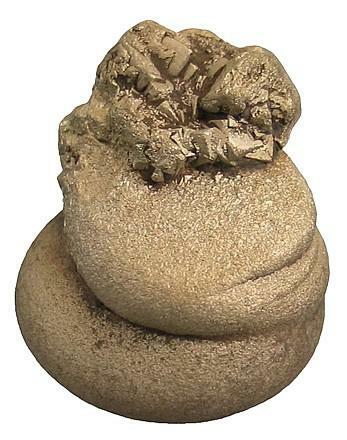 For non-alluvial (underground mined) gold specimens, which still contain silver and may therefore have a paler yellow color than alluvial gold, some dealers make the yellow surface colour richer by nitric acid baths, which duplicates the natural process of surface leaching of silver but of course at unnaturally fast rate, so no electroplating is needed. I very much doubt that anyone is electroplating gold specimens intended for collectors; for jewelry perhaps, but not for collectors. Thank you guys, for the feedback. This occurrence is definitely not a placer type, as one can observe the crystal morphology. Its been prone to some leaching, nevertheless, as some humic acid diagenesis is expected. 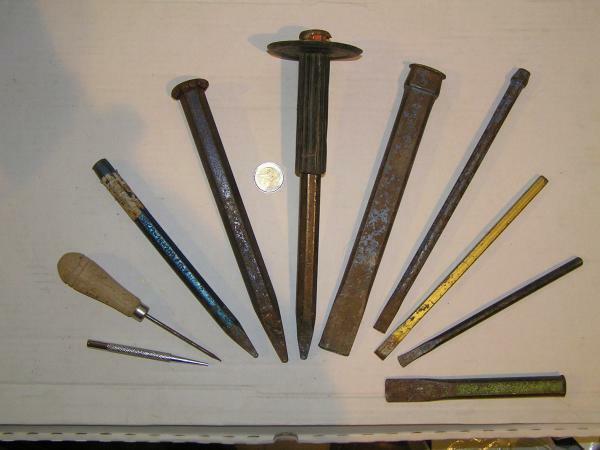 It has been enhanced by some means (nitric acid bath plus water jet for instance), as there is no matrix in the small voids/ indentation. I will proceed to further core analysis of my samples. 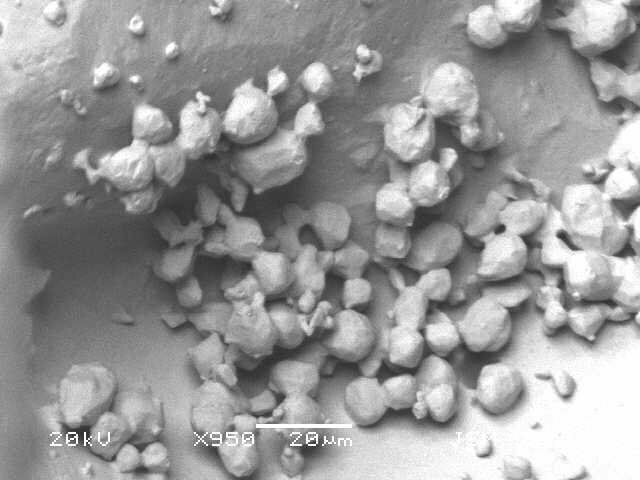 In the case you have some data of lateritic gold crystals, lets compare!